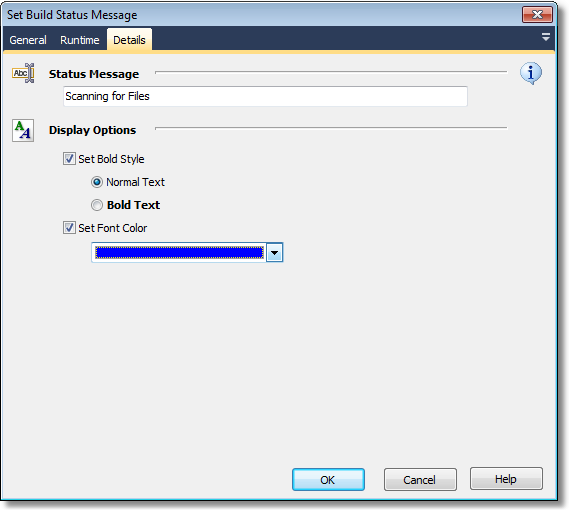 The Set Build Status Message action allows you to add a custom message to the build Status screen. This message can be anything you like - so for example it could be "Running Installer" or "Uploading". It's a message that will give you an indication as to what the current progress of the build is. 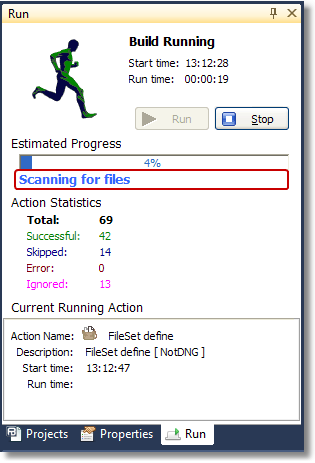 The above screen shot shows the custom status message "Scanning for files". Status Message: the message you want to appear below the progress bar. Variable references are expanded, eg. "We're now running project %CurrentProject%". Set Bold Style: overrides the current bold style. Normal Text: sets the text to non-bold. Bold Text: sets the text to bold. Set Font Color: sets the color of the text (and then set the colour using the colour combo box). When a new build is started, the status message will be cleared and the font and style set back to default (ie. Normal and Black).